Lace Monitors are obligate carnivores and opportunistic predators. They eat only meat, and will eat any meat they can capture, living or dead. They each have quite a large home range which they patrol regularly, on the lookout for food. They primarily use smell to find their prey. The flicking tongue carries airborne molecules to a specialised scent organ within the mouth. Varanus varius (Lace Monitor) 'sniffing' out prey with its huge, extendable tongue. Varanus varius is an excellent climber. We have seen small animals climbing along thin branches in tall eucalypts, and even very large goannas can quickly scramble their way up a tree trunk. They put their massive claws to good effect. Birds, therefore, do not like goannas. We can tell when there's a goanna nearby - the birds go, quite literally, ballistic! Goannas raid birds' nests for eggs and chicks, so birds will do all they can to drive off marauding lizards. Small birds have to rely on noisy, pesky swooping, perhaps managing to distract the animal enough that it falls from the tree or otherwise gives up. But larger, predatory birds, are perhaps a more direct threat. The goanna responds to the screaming Currawong with an impressive, open-mouthed 'hiss'. One day in early Spring I heard the birds making a fuss and headed out to see what was happening. Pied Currawongs and Red Wattlebirds were calling loudly. I arrived in time to see a large goanna, open-mouthed, trying to intimidate the attackers. The Pied Currawong is a large bird and has an strong, piercing beak. A high-speed dive from such a bird is enough to intimidate the biggest lizard! The lizard in free-fall. It doesn't use its hind feet in the descent, only slowing itself by the scraping of its front feet. The swooping bird gains ground. Screaming noisily, the Currawong makes another pass. The bird won out in this noisy confrontation. The battle began before the goanna started climbing the tree and continued even after the lizard had given up to slink off though the grasses. While the Red Wattlebirds and Sacred Kingfishers normally squabble between themselves, they readily join forces against a common enemy. And goannas are #1 on their hit list. Here's a glimpse of a battle in late Spring, when both bird species where nesting. 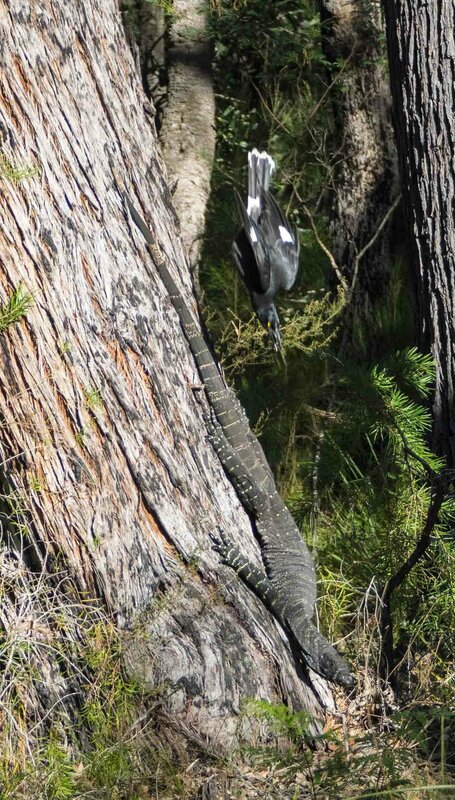 Short, flapping dive at the goanna, which is at the base of the tree. This is not actually the nest tree of either bird, but they defend their territory nonetheless. 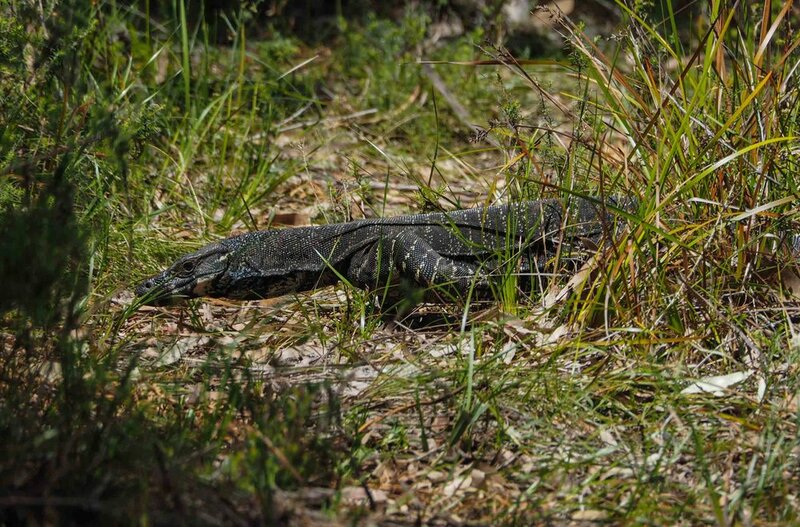 Fast, noisy dive toward the goanna, but pulling out well short of making contact. The goanna was prowling about very close to the nesting trees of both birds. They executed a prolonged and remarkably coordinated attack, taking turns in attacking the offender. The Kingfisher's dives where made from on high - long, swooping dives on outstretched wings, screaming loudly all the while. In contrast, the Wattlebird made repeated, short attacks, flapping its wings at the offender. The goanna eventually gave up and moved away.